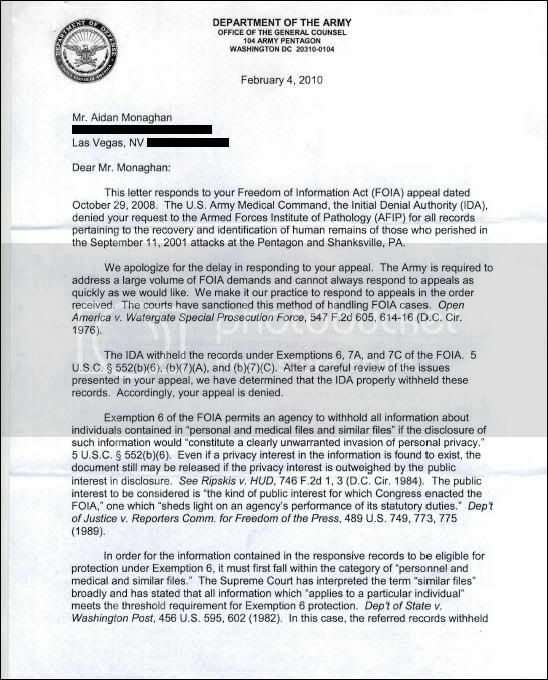 The following is a February 4, 2010 Freedom of Information Act (FOIA) appeal reply from the U.S.Armed Forces Institute of Pathology regarding a request for records that confirm the recovery and identification of terrorists accused of hijacking American Airlines flight 77 and United Airlines flight 93 on September 11, 2001. 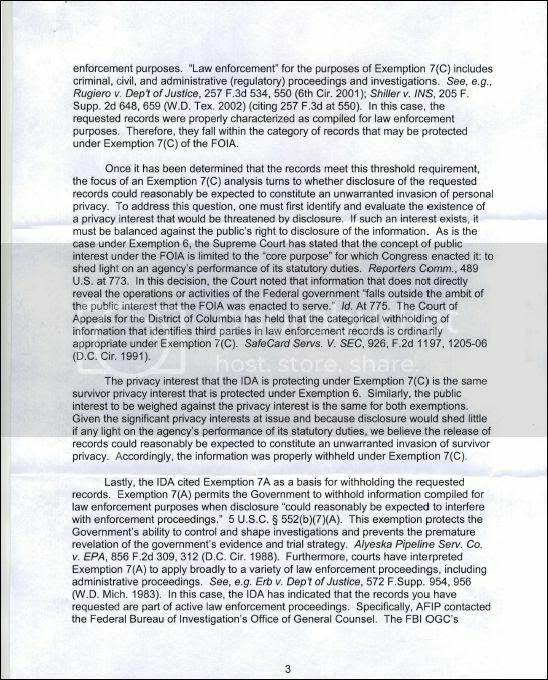 Such records are reportedly exempt from disclosure under exemption (b)(7)(a) which prohibits disclosure of information which would interfere with an on-going law enforcement investigation and exemption (b)7(c), which also provides protection for law enforcement information the disclosure of which could reasonably be expected to result in an unwarranted invasion of personal privacy of individuals in being associated with criminal activities, including investigators. According to the AFIP, the FBI considers the investigation into the terrorist attacks of September 11, 2001 as still open. This letter responds to your Freedom of Information Act (FOIA) appeal dated October 29,2008. The U.S. Army Medical Command, the Initial Denial Authority (IDA), denied your request to the Armed Forces Institute of Pathology (AFIP) for all records pertaining to the recovery and identification of human remains of those who perished in the September 11, 2001 attacks at the Pentagon and Shanksville, PA.
We apologize for the delay in responding to your appeal. The Army is required to address a large volume of FOIA demands and cannot always respond to appeals as quickly as we would like. We make it our practice to respond to appeals in the order received. The courts have sanctioned this method of handling FOIA cases. Open America v. Watergate Special Prosecution Force, 547 F.2d 605, 614-16 (D.C. Cir. 1976). The IDA withheld the records under Exemptions 6, 7A, and 7C of the FOIA. 5 U.S.C. § 552(b)(6), (b)(7)(A), and (b)(7)(C). After a careful review of the issues presented in your appeal, we have determined that the IDA properly withheld these records. Accordingly, your appeal is denied. Exemption 6 of the FOIA permits an agency to withhold all information about individuals contained in "personal and medical files and similar files" if the disclosure of such information would "constitute a clearly unwarranted invasion of personal privacy." 5 U.S.C. § 552(b)(6). Even if a privacy interest in the information is found to exist, the document still may be released if the privacy interest is outweighed by the public interest in disclosure. See Ripskis v. HUD, 746 F.2d 1,3 (D.C. Cir. 1984). The public interest to be considered is "the kind of public interest for which Congress enacted the FOIA," one which "sheds light on an agency's performance of its statutory duties." Dep't of Justice v. Reporters Comm. for Freedom of the Press, 489 U.S. 749, 773, 775 (1989). In order for the information contained in the responsive records to be eligible for protection under Exemption 6, it must first fall within the category of "personnel and medical and similar files." The Supreme Court has interpreted the term "similar files" broadly and has stated that all information which "applies to a particular individual" meets the threshold requirement for Exemption 6 protection. Oep't of State v. Washington Post, 456 U.S. 595,602 (1982). In this case, the referred records withheld by the IDA are properly categorized as the sort of "medical" or "similar files" accorded protection under Exemption 6 of the FOIA. Once determined that the records meet this threshold requirement, the focus of an Exemption 6 analysis turns to whether their disclosure would constitute a clearly unwarranted invasion of personal privacy. To address this question, one must first ascertain the existence of a privacy interest that would be threatened by disclosure. If such an interest exists, it must be balanced against the public's right to disclosure of the information. See Dep't of the Air Force v. Rose, 425 U.S. 352, 372 (1976). As the Supreme Court has stated, the concept of public interest under the FOIA is limited to the "core purpose" for which Congress enacted it: to shed light on an agency's performance of its statutory duties. Reporters Comm., 489 U.S. at 773. In this decision, the Court noted that information that does not directly reveal the operations or activities of the Federal government "falls outside the ambit of the public interest that the FOIA was enacted to serve." Id. At 775. In this case, the IDA withheld records regarding the recovery and identification of remains. Although decedent s do not possess privacy rights under the Privacy Act, courts have recognized that a decedent's survivors have a limited right to privacy in the decedent's records. See NARA v. Favish, 541 U.S. 157, 165 (2004) (holding that "survivor privacy" was a valid privacy interest). Specifically, this privacy interest allows for the withholding of documents if their release would cause "a disruption of the survivors' peace of minds." Id. At 170-71; see also Cowles Publ'g Co. v. United States, No. 90-349, slip op. at 6-7 (E.D. Wash. Dec. 20,1990). The survivors' privacy interests must be balanced against the public's right to disclosure of this information. We agree with the IDA's determination that there is no public interest in this information, as the phrase "public interest" is used under the FOIA. See Reporters Comm., 489 U.S. at 773. In other words, disclosing these documents would not shed light on the agency's performance of its statutory duties. Therefore, the survivors' privacy interest in having these documents withheld outweighs the lack of any public interest in the release of these documents. Accordingly, the documents were properly withheld. The IDA also withheld the responsive records pursuant to Exemption 7(C). 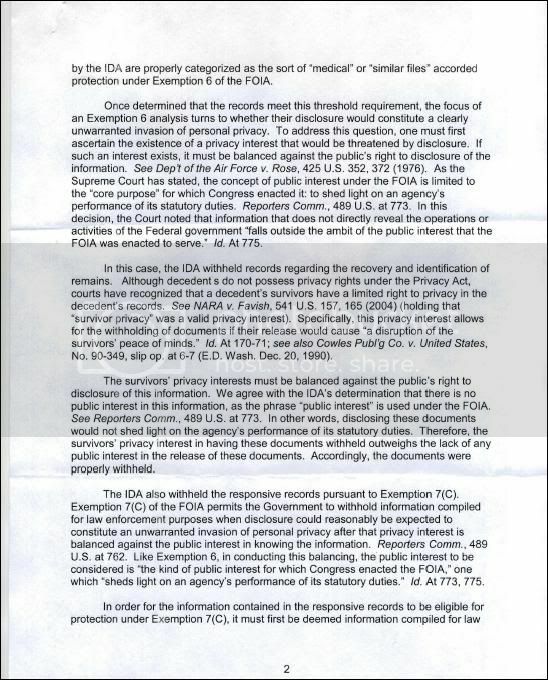 Exemption 7(C) of the FOIA permits the Government to withhold information compiled for law enforcement purposes when disclosure could reasonably be expected to constitute an unwarranted invasion of personal privacy after that privacy interest is balanced against the public interest in knowing the information. Reporters Comm., 489 U.S. at 762. Like Exemption 6, in conducting this balancing, the' public interest to be considered is "the kind of public interest for which Congress enacted the FOIA," one which "sheds light on an agency's performance of its statutory duties." Id. At 773, 775. In order for the information contained in the responsive records to be eligible for protection under Exemption 7(C), it must first be deemed information compiled for law enforcement purposes. "Law enforcement" for the purposes of Exemption 7(C) includes criminal, civil, and administrative (regulatory) proceedings and investigations. See, e.g., Rugiero v. Oep't of Justice, 257 F.3d 534, 550 (6th Cir. 2001); Shiller v. INS, 205 F. Supp. 2d 648, 659 (W.o. Tex. 2002) (citing 257 F.3d at 550). In this case, the requested records were properly characterized as compiled for law enforcement purposes. Therefore, they fall within the category of records that may be protected under Exemption 7(C) of the FOIA. The privacy interest that the IDA is protecting under Exemption 7(C) is the same survivor privacy interest that is protected under Exemption 6. Similarly, the public interest to be weighed against the privacy interest is the same for both exemptions. Given the significant privacy interests at issue and because disclosure would shed little if any light on the agency's performance of its statutory duties, we believe the release of records could reasonably be expected to constitute an unwarranted invasion of survivor privacy. Accordingly, the information was properly withheld under Exemption 7(C). Lastly, the IDA cited Exemption 7A as a basis for withholding the requested records. Exemption 7(A) permits the Government to withhold information compiled for law enforcement purposes when disclosure "could reasonably be expected to interfere with enforcement proceedings." 5 U.S.C. § 552(b)(7)(A). This exemption protects the Government's ability to control and shape investigations and prevents the premature revelation of the government's evidence and trial strategy. Alyeska Pipeline Servo CO.
V. EPA, 856 F.2d 309, 312 (D.C. Cir. 1988). Furthermore, courts have interpreted Exemption 7(A) to apply broadly to a variety of law enforcement proceedings, including administrative proceedings. See, e.g. Erb v. Dep't of Justice, 572 F.Supp. 954, 956 (W.O. Mich. 1983). In this case, the IDA has indicated that the records you have requested are part of active law enforcement proceedings. Specifically, AFIP contacted the Federal Bureau of Investigation's Office of General Counsel. The FBI OGC's Litigation Unit indicated the investigation into the September 11, 2001 terrorist attacks is still an open investigation. Therefore, the information was appropriately withheld under this exemption. 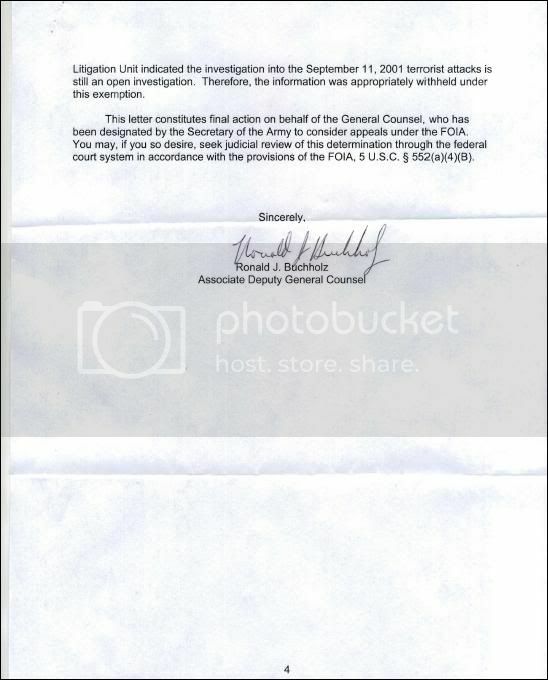 This letter constitutes final action on behalf of the General Counsel, who has been designated by the Secretary of the Army to consider appeals under the FOIA. You may, if you so desire, seek judicial review of this determination through the federal court system in accordance with the provisions of the FOIA, 5 U.S.C. § 552(a)(4)(8). Aidan, again, thanks so much for the work you do! "...And within the next three days (of 9/11/01) we found that 18 and then 19 Arab hijackers (Hani Hanjour, the supposed, incompetent pilot of American Airlines Flight 77 into the Pentagon, came last) were there for billions to blame, materialized into a TIME cover-sized row of ‘al Qaeda’ targets through marvelously rapid efforts of the United States’ Federal Bureau of Investigation , the Official Story seeming as ready made as the PATRIOT Act that swiftly accompanied it. ...."
"...The ‘Clean-up’ installment of Kevin Ryan’s ‘Demolition …’ study reports new accounts of criminality by the United States’ Federal Bureau of Investigation. FBI agents Richard Marx, Pasquale (“Pat”) D’Amuro, Kevin Donovan, Edwin Cogswell and Barry Mawn are found by admissions within their own ranks to have stolen significant pieces of steel and other evidence from the Fresh Kills landfill to which WTC wreckage was hauled (footnotes 105, 106). Pat D’Amuro was the lead FBI Agent into investigation of the 1993 FBI-assisted bombing of the Twin Towers and–according to FBI Director Robert Mueller’s commendation in promoting D’Amuro to be the Bureau’s Assistant Director of Counter-Terrorism on January 31, 2002–also headed ‘the PENTTBOM investigation’ that somehow identified all 18 and then 19 supposed Arab hijackers (Hani Hanjour, the incompetent, supposed pilot of American Airlines Flight 77, was a latecomer to the FBI’s list) within 72 hours of the 9/11/01 morning. D'Amuro heading the identification of the hijackers within 72 hours of 9/11. The PENTTBOM acronym is ironic. TomT on Wed, 02/24/2010 - 12:13pm. FBI Special Agent John Anticev was one of Emad A. Salem's handlers in the 1993 WTC FBI-assisted bombing (Anticev and Salem can be heard talking about the FBI bomb in the following link: http://www.liveleak.com/view?i=e88_1192741655). Interestingly, thanks to Anticev's smashing performance five years earlier in the 1993 WTC bombing incident, Anticev was assigned to investigate the 1998 American embassy bombings in Africa (http://archives.cnn.com/2001/LAW/02/28/embassy.bombing.01/). It's nice to see that it is now common knowledge that the 1993 WTC bombing was actually assisted by the FBI; the FBI provided the actual working bomb and by not following the terrorists to the WTC and arresting them there, that proves the bomb was allowed to explode intentionally! brian78046 on Wed, 02/24/2010 - 1:11pm. Aiden, you are still separately entitled to an inventory or list of the items they are denying based on their exemption under FOIA. That inventory list itself coulf only be withheld if the list itself is subject to an exemption. get the inventory list! Ferric Oxide on Thu, 02/25/2010 - 6:48pm.